The long waited 15.5km Northern Connector is scheduled to be finished work in late 2019 completing the North-South Corridor. This motorway completes the commuter link between the Northern Expressway, South Road Superway and Port River Expressway. At six lanes wide, this development offers a vital role in the expansion and efficiency of freight for the commercial and industrial businesses to the port and the North & North-West. 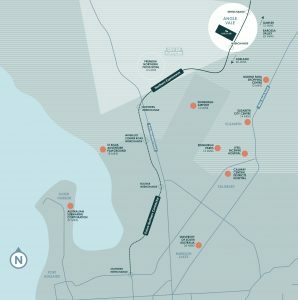 With 73% of workers in Playford driving to work, once completed the Northern Connector will drastically reduce commute time and congestion to the CBD. One completed the Northern Connector will include a 16KM bike path for cyclists and pedestrians and for new road interchanges. Miravale is perfectly placed to take full advantage of this $885M infrastructure upgrade.